Growth #2 – Is Yeast Alive? 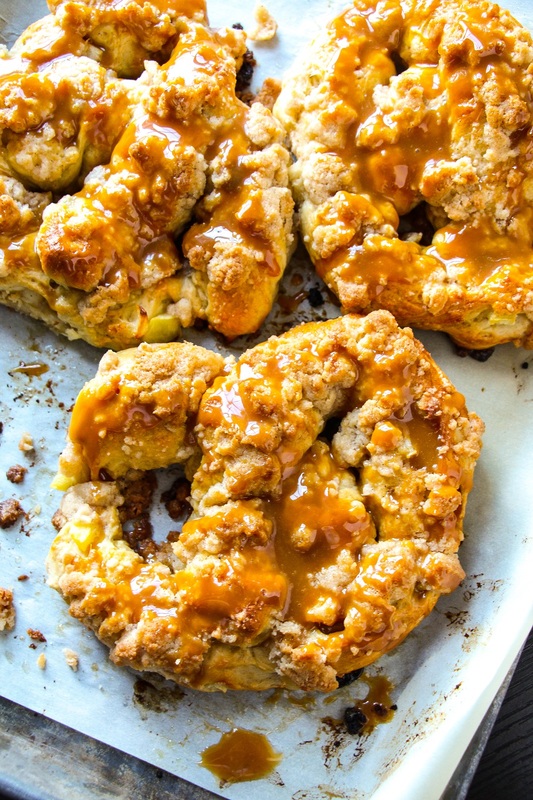 Everything you love about apple pie – the gooey cinnamon filling, the warm apples, the buttery cinnamon sugar crumble – all baked into a 30-minute soft pretzel dough – finished off with some salted caramel. This fun and festive dessert is something everyone will love. (1) Combine water, yeast, and sugar in bowl of a stand mixer that is fitted with a dough hook, until fairly mixed, about one minute. Some clusters of yeast will remain. Let rest for 5 minutes. (2) In medium bowl combine flour, cinnamon and salt. Add flour and salt mixture to the yeast mixture and knead for 2 minutes. If dough is super sticky add small amounts of flour until dough stops sticking to sides. Do not add more than ½ cup. Add apples and mix until evenly distributed. (3) Let dough rest for 15 minutes. (4) Preheat oven to 425°F. (5) Turn the dough out onto a floured surface. Knead the dough for 1-2 minutes and shape into a ball. It is okay if some of the apples fall off. (6) With a sharp knife or dough cutter, cut ball of dough in half and then into thirds to make 6 smaller balls of dough. Each ball should be a little over ½ cup. (7) Take each ball of dough and roll into a rope, about 20-25 inches long. As even in diameter as you can get it. (8) To shape the pretzel, take the ends of the rope and draw them together so the dough forms a circle. Twist the ends, then bring them towards yourself and press them down into a pretzel shape. (9) In a small bowl, beat the egg and water together and pour into a shallow bowl or pie dish. Dunk the shaped pretzel into the egg wash (both sides). Place on a baking sheet lined with parchment paper and sprayed with nonstick baking spray. (10) To make the streusel: In a small bowl, whisk together flour, sugar and cinnamon, add melted butter and stir with a fork until crumbly. Spoon streusel evenly over pretzels. (11) Bake for 10 minutes, remove the pretzels from the oven and brush with melted butter and before returning them to the oven to bake for 5 additional minutes. (12) Remove from oven, drizzle with warm caramel, allow to cool and enjoy. Serve warm or at room temperature. Best when fresh from oven, but pretzels may be stored in an airtight container or zipped top bag for up to 3 days or frozen for up to 3 months. Recipe created by Layers of Happiness. Click the button below and share your comments. Sign up for our e-newsletter to stay 'In the Dough' with recipes, baking tips and more!